Maharashtra Government and Revenue Department of Maharashtra State made a Online portal https://www.mahabhulekh.maharashtra.gov.in or Portal of Bhumi Abhilekh. We developed http://www.satbara.org to guide a information to people to How to get a Mahabhulekh 7/12 in Marathi or How to get a Satbara Utara Online.? 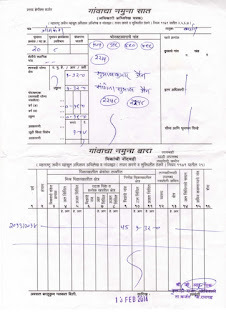 Satbara gives a information regarding land records of Maharashtra. Satbara gives information of Land owner, Survey No. Crop etc. You want to get a information related any land of Maharashtra then Mahabhulekh Portal helping it out to get information on single click. You can download Satbara Utara (7/12) Online, 8A and Malmatta Patrak or Property Card from official portal of Mahabhulekh. In this article we will help you to How to Download Satbara Utara Online from Mahabhulekh. Looking to Download Mahabhulekh 7/12 Satbara Utara Online from official Website then you need to follow few simple steps to Download it. Check out following steps to download your Mahabhuekh 7/12 in Marathi. Then You must check Division First. After that Select Taluka, then Village. Now Click on Search Button "शोधा". You get your Satbara in new pop Window. Now Take a printout of it for your reference. While Searching 7/12 on Mahabhulekh you face any problem then just comment below. Our Team will help you to solve your problem. Maharashtra Government started Bhumiabhilekh (भूमि अभिलेख) Department to keep all land records of Maharashtra. https://bhumiabhilekh.maharashtra.gov.in is the official website of Bhumiabhilekh and want to get a Satbara online then here we are giving information about Bhimiabhilekh. Now day government launched Mahabhulekh website (https://mahabhulekh.maharashtra.gov.in) to get Satbara (7/12) Utara Online. When you buy a new land and wants to register your name on that land then you must go to Maharashtra State Revenue Department (महसुल विभाग). While doing registration you must know previous details at that time you get a record through Maha Bhumi abhilkeh. How to Get Land Record through Bhmiabhilekh? While buying or selling of land or you want to take land information through 7/12 utara then Bhimiabhilekh is the right place to get all land records. Want to download Land Records then you use the official portal of Maharashtra Government. From Satbara you got a information of owner of Land and few other information. Satbara have information like Land owner's name, Village/Town, City, District, How much area have, Crops details, Loans and few other information. Most of peoples who don't know about Satbara Utara, they may ask why it is important.? Which information is inside this Satbara Utara?. From this satbara Utara (7/12) you get a most of all information of Land which you took a satbara Utara. Where is the Satbara Utara is useful? >> It is actual proof of land. >> It used when anyone wants to sell a land to other onece. Here we are giving you step by step information regarding how to get a Satbara Utara Online through Bhumi Abhilekh (भूमि अभिलेख)? Previously you get a satbara Utara Online through Bhumiabhilekh website (https://bhumiabhilekh.maharashtra.gov.in) . Now government retained website for information regarding Bhumiabhilekh but they changed website to download 7/12 Utara Online. For download Satbara Utara Online you must go with https://mahabhulekh.maharashtra.gov.in. 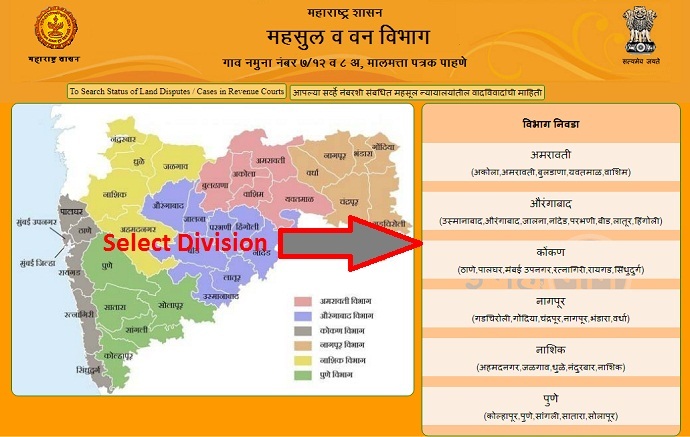 Then select which Division (Because there are total 6 Divisions: Amaravati, Aurangabad, Konkan, Nagpur, Nashik, Pune). After Selecting diviison. Select 7/12. 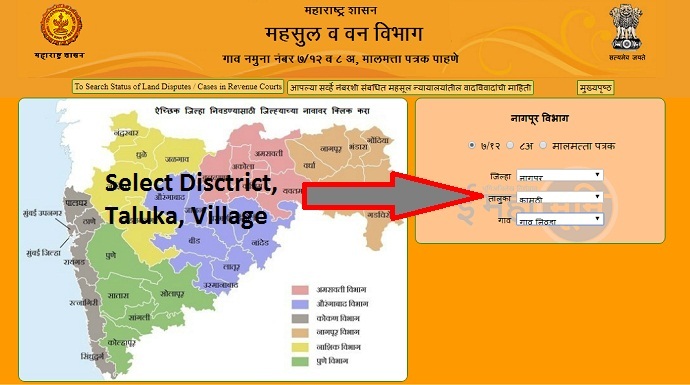 Then Select Disctrict, then Taluka, then Village. Now for searching a 7/12 Utara Online. If you know a survey Number or Gat Number then put there otherwise you select any one of First name, Middle Name, Surname or direct full name. Put the correct information there. While searching Satbara Utara Online, you got a any problem then just comment below we will try to solve your problem. You are looking for 7/12 Utara Pune Online to download then Mahabhulekh is the official web Portal of Maharashtra Government's Revenue Department and Bhumiabhilekh. 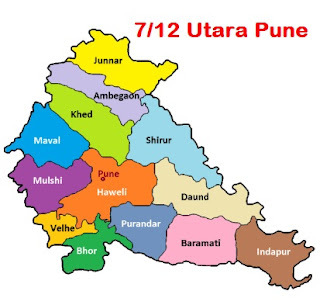 Here we are giving you direct link to download your 7/12 Utara and Procedure for Getting 7/12 Pune Utara Online. Maharashtra Government land records divided into 6 division and Pune is one of the Division of it. It's very easy and simple way to get Satbara Utara Online from official website. You can use either website of Mahabhulekh or Android App of Mahabhulekh to get your Satbara Utara Pune Region. There are simple steps to download your 7/12 Utara Pune from Mahabhulekh. Follow the following steps to get your 7/12 पुणे उतारा Online. Then Select district (जिल्हा) Pune. Then Click on "Search (शोधा)"
You get your 7/12 Utara Pune in Pop-up Window. Download 7/12 Utara and Take a Printout. While finding 7/12 Utara Pune Online any difficulties then just comment below. Our Team will try to solve your Problem. Most of people are living in Cities because of jobs, services or any kind of business. Most of people have lands in their villages and they don't know about How much Land is there? Which crop is there? If you want to know more about your Agriculture land then Satbara (7/12) is important. You get a detailed information about your land by using Satbara Utara. 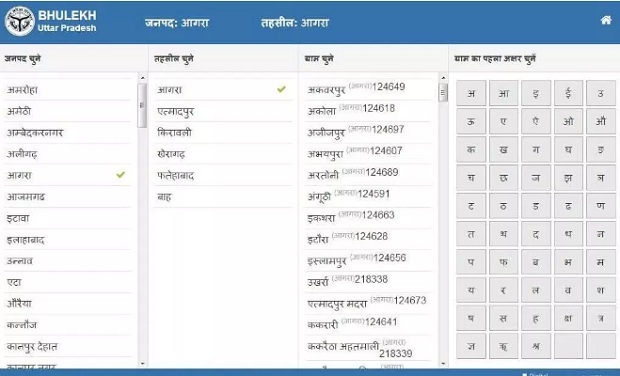 Maharashtra government developed portal named Mahabhulekh where you get a detailed information of your land through 7/12 and 8A Records. You can called mirror of Land. Because you get a all information of your land at home without going into land. There are total 21 types of sections of village land in Maharashtra Land Revenue Code 1966. Combined of form 7 and form 12, we got a 7/12 Utara. How to Read Satbara 7/12 Utara? In Satbara Utara there are two sections one is form 7 and another is form 12. Both are combined in single form. While a buying and plot or agriculture land you need to get a 7/12 Utara first. 7/12 Utara clears your all doubts regarding land. You must remember that satbara cannot be used for transfer land from one owner to another owner. How to Get a Satbara (7/12) Utara? You get a satbara Utara from Tehsil Office. Recently Maharashtra Government's Revenue Department launched official website to Download your 7/12 from Online. https://mahabhulekh.maharashtra.gov.in is the official website of Mahabhulekh or Bhumi Abhilekh to Download your Satbara Utara with few simple easy steps. It is used in any civil legal disputes. It contains important information like loan, legal disputes etc..
Are you from Uttar Pradesh or you are looking to buy any land in Uttar Pradesh then you must get a Khasra Khatauni. But Most of people are thinking that it's difficult because you need to go at government Office. But now It's a very easy process to get a Bhulkeh or Khasra Khatauni then you get a Uttar Pradesh Land records on single click. Because Uttar Pradesh Government recently launched a web Portal to get any land records on single click. This web portal was launched in 2 May 2016. Uttar Pradesh BhuLekh is comes from two hindi words Bhu and Lekh. Here Bhu means a Land and Lekh means record or details. Bhulekh means land record with name of owner, area and other most details. How to Get a Khasra Khatauni (खतौनी खसरा नक्शा) Online from Bhulekh Web (https://upbhulekh.gov.in) ? Are you new or don't know about How to download your land records through Website then here we are going to give you step by step procedure for downloading you Land Records. There are few simple steps to get you land records with few steps of it. Here we are giving you step by step procedure to get Khatauni Bhulekh. Step 2 : Now click on " Khatauni (खतौनी ) ki Nakal"
Step 3: You see on Captcha Code dialog box. Now you must enter a captcha code correctly as per case. Step 4: After that you see a new window where all district of Uttar Pradesh see. Select your District from that list. Step 6: Now Select Village. After Selecting your village you see a new window. Step 7 : Enter a credentials. Here you must enter your Gata No. If you don't have your Gata No. then search your Khatauni by entering your "Account Number". If you don't have your account number then just go with "Search by Name of the Account Holder" option. Your account details of Khatauni is available on your screen. Take a print out of it for further uses. Why Bhulekh Online is Important? Every days, we must visit to Revenue office or revenue department to take a land records. It's not a easy way to get quick action. After visiting a government office you need to give all information after that you get a your land records in one or two days. That was a very time consuming process and you need to visit government office. This online system of land records, saves your time. Maharashtra Government also launched official website for land records with Mahabhulekh site to get your Satbara.